Many days, you’ll find Bill standing in his driveway near Blue Eye, Missouri, opposite where State Highway JJ goes north of Missouri 86, making kayaks, canoes and small boats, whose beauty is apparent even to those driving by at highway speed. His boats are “strip-built,” which means the hulls and decks are made of 1/8-inch thick strips of cedar, an inch or so in width, glued on their edges, and clamped over forms called molds. After the hull and decks are assembled, they are overlaid with fiberglass cloth impregnated with polyester resin, which dries to form a tough, semi-rigid shape. Driving along Missouri 86 about 15 miles west of US 65, Bill’s inventory caught my eye. I stopped to look on Sunday, as did several other people. 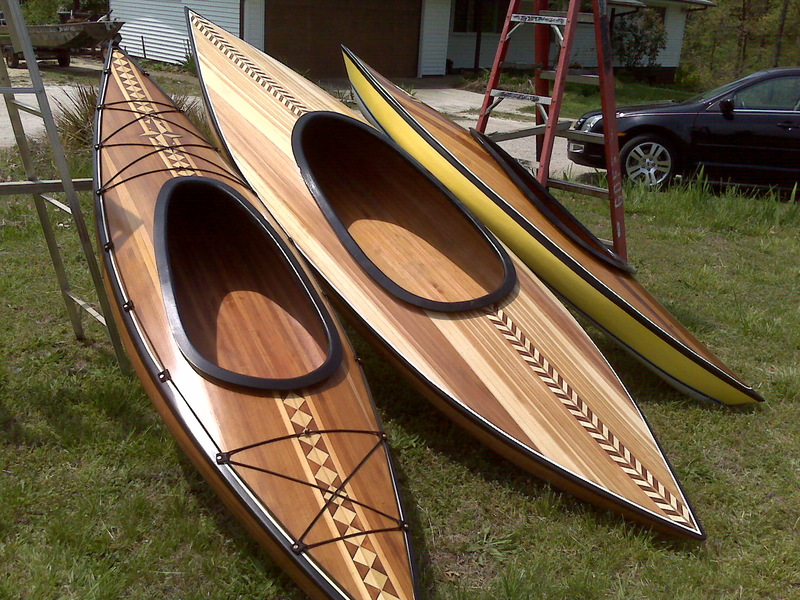 While I was there, the middle kayak was sold. Most people don’t realize that a kayak should be built to fit the person who will use it and designed for the type of water that it be most often used in. For a custom kayak, the maker may want to know the width of your hips, the span of your outstretched arms and the length of your legs. The size of the cockpit opening must comfortably accommodate your girth. If carving through whitewater is your sport, you’ll want foam surrounding your seat and thighs so that you can turn and roll the craft with your body working with your paddle. Your whitewater kayak should be short and maneuverable. If you want to travel largely by paddling, rather than be carried by swift current, you’ll probably want a kayak that’s longer than fourteen feet, so it will maintain a straight course and greater hull speed. Bill can fix you up, usually for less than $1,000, with a kayak that is lightweight, strong and beautiful. The foam seat, spray skirt and paddle are additional and available in stores. Bill also makes makes canoes and small fishing boats. Posted in Ozarks economy and tagged canoe, kayak, strip-built. Bookmark the permalink. We are a brand new shop and also the direct importers for popular brands including Prijon & Cobra. If you have any questions feel free to drop by and give us a bell. We are currently having a big 25% opening sale, and would like to know if you could give us a review or writeup on your blog about our new site. Looking froward to some of your future blog posts, catch you around! better and is not much more expensive than polyester. have a bunch of them ! Happy holiday. Bill told me that he used polyester resin with the fiberglass cloth on the kayaks. Eastern red cedar (the Missouri kind, which is a juniper) is a very different tree than the western red cedar (a cypress) that Bill uses in building kayaks. I suppose both species are called “cedars” because they are aromatic conifers, but they seem similar in only superficial ways. I’ve seen some eastern red cedar without knots, but it’s rare.